Volkswagen in South Africa is promoting the Bluemotion range of vehicles with the Bluemotion Label. A print insert was included in magazines, designed to save paper, not waste it. Readers were able to peel the label off, attach it to the magazine they’d finished reading, and send it off to a recycling agency. The campaign won Silver and Bronze Lions at Cannes 2012. 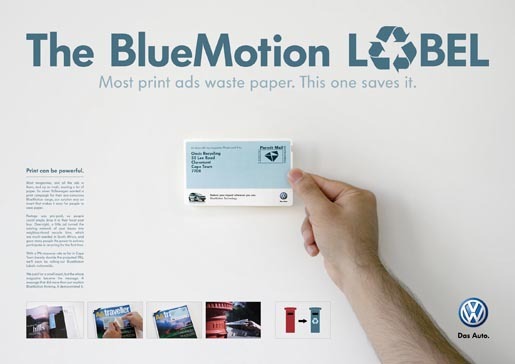 The Bluemotion Label campaign was developed at Ogilvy South Africa Cape Town by executive creative director Chris Gotz, art director Prabashan Gopalakrishnan Pather, copywriter Sanjiv Mistry, producers Cathy Day and Lara Bothma, account management team Jason Yankelowitz, Greg Tebbutt, Lauren Baker. Production was done at Platypus Productions.